Continuing in the tradition of hard work and innovation established by William Lyne in 1826, Rodney and Lyn Lyne have planted 14.5 hectares of wine grapes at Spring Vale, principally Pinot Noir. The vineyard began in 1986 when a small area of 0.8 hectares were planted to Pinot Noir. Further plantings were made in the following years: firstly, more Pinot Noir, then Chardonnay and Gewürztraminer, followed by Pinot Gris in 1996. In 2000, more Pinot Noir and a splash of Pinot Meunier were planted. A further 7.9 hectares of Pinot Noir were then planted in 2013. In June 2007, Spring Vale purchased a neighbouring farm, "Melrose". The purpose was to enable increased production of a lighter style red to be produced, with the first "Melrose" Pinot Noir being the 2008 Vintage. The Freycinet Coast is the driest part of the state, with an average annual rainfall of 550mm. Warm days and cool nights are a result of this climate and ideal for slow ripening and excellent flavour development. The soil at Spring Vale is mostly a fertile clay loam, with the subsoil varying from porous friable loam with rock to medium-heavy clay. Drainage is excellent throughout the vineyard and the pH of the soil is around 6.5. A modified Lyre ("U-shaped") trellis system is used in conjunction with vertical shoot positioning (VSP), while the blocks planted in 2000 and after have a simple VSP trellis. "Melrose" is entirely VSP. Vineyard operations are mostly carried out manually - pruning, shoot positioning, leaf plucking and harvesting, although a tractor-mounted pre-pruner is being used with great success, as well as a tractor-mounted leaf-plucker on many parts of the vineyard. Spring Vale Vineyard was established by Rodney and Lyn Lyne in 1986. Rodney oversees production at all levels and also tends to his 100 head of Angus beef cattle. Tim is one of Rodney and Lyn's sons who came back to Spring Vale in September 2006. 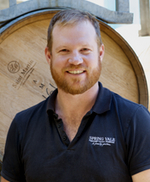 Tim has completed an Honours Degree in Viticulture and also a Masters of Business Administration with concentrations in entrepreneurship, marketing and finance. He has also obtained invaluable experience in vineyard and winery operations on the mainland and now General Manager and Viticulturist at Spring Vale. In 2009, we were joined by the former Executive Chef from nearby Freycinet Lodge, Konrad Melling. 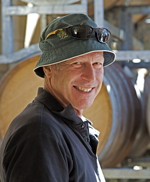 Konrad can be seen doing many different activities at Spring Vale - he is frequently called on for cellar door duties, but is also very able in the vineyard, in the tractor, in the winery or promoting Spring Vale across Australia. A genuine multi-tasker with a passion for wine and food. The whole team functions well together to create a friendly, hard-working atmosphere, passionate in creating the award-winning premium wines Spring Vale is known for.